Richard Jensen, a bread route salesman for Catherine Clark Baking Company of Oconomowoc WI, single-handedly and with extremely limited means, managed to acquire four steam locomotives to be preserved for steam fan trips out of Chicago in the early 1960s. His first acquisition was GTW 4-6-2 #5629. Later, he acquired CB&Q 4-8-4 #5632 and CB&Q 2-8-2 #4963. However, the story does not have a happy ending. Two of these four steam locomotives ended up being scrapped. The two that survives today are the CB&Q 4960 in Williams, AZ and the CB&Q 4963 in Union, IL. Richard Jensen purchased 5629 from the GTW in 1959. He, and a small group of volunteers worked many hours and returned it to operating condition. The first 5629 excursion trip on the B&O was advertised (in TRAINS Magazine) in the fall of 1961. However, after only two excursions the market became saturated with other company-operated trips on the GTW. The first 5629 excursion trips on the Grand Trunk Western were run in late October 1966. They were sponsored by the Railroad Club of Chicago. The 16 car train trips were lightly attended even though the fares were only $7.75. The low fares were due to an Illini Railroad Club trip with 6218 being offered on the same line two weeks later for $6.50. The Illini trips with 6218, run at cost, actually lost money for GTW while having more attendance than that of the 5629. Because of the low attendance, the Railroad Club of Chicago owed Jensen $2500 for trip expenses that were not met. Jensen accepted a promisary note with no interest and no due date in exchange for services to be rendered by club members on future operations. In 1967 through 1969 Mr. Jensen ran 10 successful trips and 2 failured trip on the Grand Trunk running out of Chicago and Detroit. The 5629 was also used in 1967 and 1968 to pull the Circus World Museum Schlitz Circus Train out of Baraboo, WI. The 4960, a 2-8-2 was first used in CB&Q excursion service on December 28, 1958 when the Illini Railroad Club sponsored a trip between Chicago and Ottawa. The photo to the right shows one such trip where railfans scrambled to get "the perfect shot". One certainly wouldn't see a railroad allowing something like that today! 4960 received a major overhaul in 1961 where she received new tires, flues, arch tubes, and arch brick. 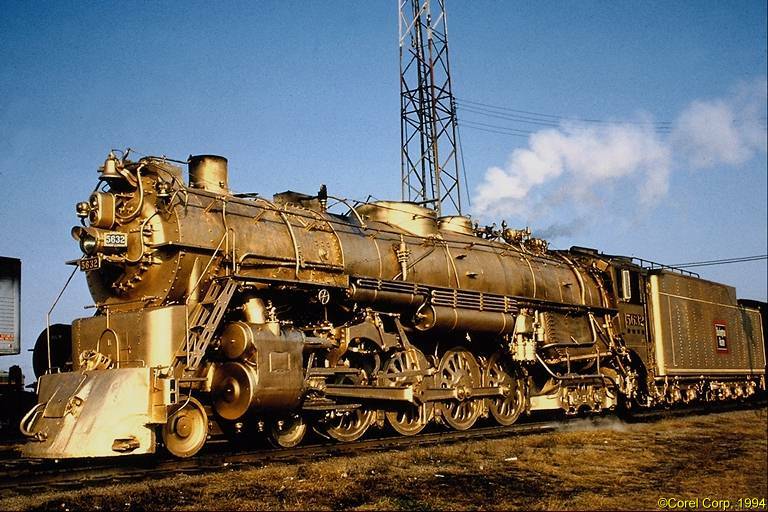 4960 was painted gold for the 50th (golden) anniversary of service to Casper, WY which ran on October 20, 1963. TRAINS magazine labeled it the Tenshodo Mikado because it looked like a brass locomotive as seen in hobby shops. In the summer of 1965 4960 was used to pull the Schlitz Circus Train between Baraboo and Milwaukee (see photos below) On March 4, 1966, after over seven years of excursion service, the CB&Q announced that steam trips would be discontinued after 4960's July 17 trip. 4960 was retired to the Circus World Museum where she remained on display until donated to the Mid-Continent Railway Historical Society's museum at North Freedom, WI. In 1980, she was leased to an excursion operator, the Bristol & North Western (B&NW) Railroad, in Bristol, VA. A short-lived reprieve, she entered service running out of Benham, VA, during the summer of 1981. During this time, a personal relationship began between 4960 and two present Grand Canyon Railway employees: Ervin White, train master, and Robert Franzen, superintendent motive power. White was part of the crew that prepared 4960 for the trip and moved her from North Freedom to Bristol. He stayed on with the B&NW in charge of train operations and maintenance of the track. At this same time, Franzen signed on with the company as a fireman. Both worked on the engine to prepare her for the 1981 season and continued to operate her throughout the summer as firemen and engineers. By 1984 the the B&NW went out of business and Franzen ran her for the last time from Benhams to Bristol. Both White and Franzen bid her farewell, not knowing they would eventually meet again. In March 1985, 4960 was moved to Ft. Wayne, IN, where she declined in storage until purchased by the Grand Canyon Railway. Shortly after the reinaugural of the Grand Canyon Railway on September 17, 1989, mechanics dissembled most of the components and shipped the running gear on trucks and the frame, boiler, cab and tender on flat cars to Williams, AZ. Finally shopped in July 1993, she began one of the most thorough overhauls of a steam locomotive in modern times. Stripped of all running gear, tubes, electrical systems, bearings, pumps, stay bolts, and coal systems, she looked a bit forlorn. But, as newly manufactured and rebuilt equipment is added to the basic frame and boiler, the huge engine continued to take on a new life of her own. Boiler men, welders, electricians, and mechanics turned out flue sheets, pumps, fittings, and running gear to low tolerance specifications from raw material that made 4960 the queen of the United States steam fleet. No rebuilding in the past 45 years has been so complete. Franzen was in charge of this massive rebuilding project that spanned more that 24 months and expenditure of hundreds of thousands of dollars. Ervin White supervised train operations. The CB&Q started using 5632 on fan trips when she was hauled out of retirement for a November 2, 1958 re-enactment of the run of the Aristocrat from Chicago to Galesburg. In total, the CB&Q used 21 different locomotives for their company-powered excursions. The 5632 was used to power some of them. Occasionally, the CB&Q ran doubleheaders. A photo below shows a September 6, 1959 doubleheader with 6315, a 2-10-4 on the point. On this trip, 6315 had a mishap where she lost both of her eccentric rods. 5632 saved the day by pushing the crippled 6315 to Galesburg while towing the 18-car train. By 1961 she needed a major overhaul. The superheater coils were reworked, the firebox was rebricked, the boiler was relagged, 97 staybolts were replaced, and she received a new paint job. All of this was done at the Galesburg Shops. In 1964 5632 was painted with temporary (water-based) gold paint to help commemorate the 100th anniversary of CB&Q's suburban service. Chicago - Aurora runs were made on May 20, 1964 (a mid-week trip - on the actual day) and on May 23rd. The May 23rd trip consisted of a record number of passengers (about 3500) for a CB&Q fan trip (22 coaches were used). By June, 5632 was once again painted black. However, 5632 was again painted gold to celebrate the 50th anniversary of the opening of Kansas City Union Station with a trip to St. Joseph on October 31, 1964 and a trip to Bevier, Missouri on November 1. The trip on November 1, 1964 proved to be 5632's final (CB&Q excursion) trip for when she returned to Galesburg, she was stored unserviceable with no further extension on flue removal. In 1965, a class 3 overhaul was authorized by retiring president, Harry C. Murphy. The CB&Q shop forces at West Burlington had removed the flues and fire brick. However, the CB&Q was unable to recruit the 14 men that were required to put 5632 back into service and in 1966, new president Louis W. Menk ordered the repairs to be stopped. In 1966, Mr. Jensen obtained both CB&Q 5632 and 4963 as scrap. 4963 had last worked in revenue service for the Bevier & Southern. After 1964 it was held briefly by the CB&Q as a parts supply for 4960 which was being operated in company-sponsored excursion service. Many older locomotives were sent to Galesburg to await scrapping, as shown on the right. However, 4963 was spared this fate. Shortly after 5632 was "retired" from excursion service by the CB&Q, Richard Jensen obtained a lease on a portion of the Chicago & Western Indiana 47th Street roundhouse in Chicago. The C&WI at one time used the roundhouse and yard to provide Chicago terminal services for the Erie, Monon, C&EI, Wabash and GTW railroads, all of whose trains terminated in C&WI's Dearborn Street Station. After the demise of steam on these railroads, Mr. Jensen was able to rent a stall in the roundhouse for 5629 and again began running excursions. Richard Jensen would maintain and operate his locomotives based out of the C&WI roundhouse. 5632 was obtained in dismantled condition (no flues and no staybolts in the firebox) with three boxcar loads of parts including CB&Q steam shop equipment. It needed $100,000.00 plus worth of labor to restore in 1966 dollars! He also had purchased 2 ex-CRI&P oil tanks (formerly a 4-8-2 tender and a 4-8-4 tender) for water cars. The 4-8-4 tank would later become the water car for the Pere Marquette 1225. From the late 1950s through the early 1960s a Railfan Club war existed in Chicago. With the Illini Railroad Club on one side and the Central Electric Railfans, the Railroad club of Chicago, the Midwest Railfans Assoc. and the Brotherhood of Railfan trainmen on the other. Due to deliberate club competition and railroad company competition, the price of tickets in Chicago based trips was forced to a zero profit margin. Richard Jensen ran the 5629 on two Illini trips and made the sum total of $78 to cover all of his out of pocket storage and maintenance costs. The trips were run on a flue extension. Realizing that we would soon need money to reflue the engine and that the small tender would not be economical for running the type of trips that a competitive market would need to operate and that the storage costs at the 18th street roundhouse of the B&O did not lend itself to future plans, Jensen reached an arrangement with the C&WI for storage of the 5629 and the spare tenders inside the Roundhouse and outside for the work and storage cars along with use of the C&WI backshop. By 1969, the presidency and control of the C&WI had changed and Richard Jensen knew that his time at the C&WI roundhouse was short. Knowing that his lease for space at the roundhouse would not be renewed, Richard Jensen spent most of the summer moving parts, tools, and machinery out of the roundhouse and into freight cars, but because it was in the middle of a major rebuild, and therefor difficult to move, 5632 remained in the roundhouse. At 2:00 AM on a Saturday morning in August while Richard Jensen and Rich Young were figuring how to move the drawbar buffer on the 4963 to the same height as the buffers on either the IC 2612 or 2613 tenders, Western Union arrived with a telegram from C&WI stating that Jensen had 48 hours to vacate the premisses! But, Richard Jensen had no means to do so. After 60 days of waiting, no inspection of the equipment was performed by C&WI and no movement took place. Suddenly, the C&WI moves all of the equipment including the 5632 in a special move to the 88th street yard. Richard Jensen, in an attempt to find out what is going on, contacts the C&NW and CWP&S to find out if any attempt is being made to inspect the equipment and is informed that efforts to inspect at Jensen's request have been denied by the C&WI. After 3 more weeks the equipment is suddenly moved to the Erman Howell scrap yard at 83rd street. The 5632 derails during the move into the scrap yard. Jensen waited until his lease expired then asked the C&WI when the move of his equipment was going to be completed. In return C&WI sent him a draft for $4800.00. At this point Mr. Jensen files a lawsuit against the C&WI. Originally the suit requested delivery of the equipment and payment for deprivation of use. The scrap yard cuts up 5632. Now a steady stream of Jensen's equipment is being loaded on weekends into railroad cars and into trucks and being hauled away! Jensen refiled the suit asking for full repayment of value of the engines, railroad cars, and the equipment contained therein. 4963 was put into storage at a Chicago scrap yard. Fortunately, GTW 5629 was still in Detroit at this time and therefor was "safe". Jensen won the lawsuit and was awarded $707,007.49 plus $1,000,000.00 in punitive damages. Richard Jensen had used the GTW 5629 on some semi-successful excursions on the GTW out of Chicago in the late 1960s. However, on April 25, 1971 a fan trip from Chicago to Logansport, IN via Penn Central using GTW 4-6-2 5629 was cancelled due to difficulty in dealing with CRI&P, Penn Central and AMTRAK. The money from this trip was reportedly never refunded by Mr. Jensen to the passengers. However, this is not true. This is what happened. Richard Jensen needed 18 to 20 cars to hold the 1300 tickets that had been sold (Penn Central was going to provide them). First, Penn Central backed out of their car offer. Richard Jensen then acquired 18 high capacity cars from the CRI&P and CMStP&P. On Friday the CRI&P informed Richard that the 12 CRI&P cars were in Davenport, IA and he would have to pay to get them to Chicago. Richard provided the money to get the cars. On Saturday at 10:00 AM, the CRI&P stated that they not only wanted the cost to transport the cars but also insurance coverage for the cars between Davenport and Chicago. Richard Jensen's insurance agent said they would not cover the move between Davenport and Chicago as the railroad is the carrier of their own equipment and should be responsible for their own railroad liabilities. Therefore, the trip was rescheduled for two weeks later. However on Monday the Penn Central referred Jensen to see AMTRAK. But AMTRAK referred him back to Penn Central. The trip had to be cancelled. When Jensen asked for the return of his money, he was told that "You will be creditor #97 in list of creditors and you may see your money in 90 to 120 days." It took almost a year to get the money back from the railroads, however only 38 cents on the dollar was refunded. On a 1972 Southern 4501 trip on the CRI&P, any ticket holder of that ill-fated Penn Central trip was offered a free $20 ticket or a full refund of the original $16 ticket price. However, a number of the passengers on the ill-fated Penn Central trip chose to bring a law suit against Richard Jensen instead. For the next 20 years if someone met Richard Jensen and told him they were an unpaid ticket holder, they would get their money back. By the late 1970s Richard Jensen was in poor health as a result of an accident (he suffered a serious fall in a freak accident while helping a friend move a refrigerator to a third floor apartment), and was hospitalized for a long time. Tragedy struck again in the 1980s. In 1987 the 5629 was stored in Rock Islands Blue Island (IL) yard south of Chicago. It was left with the tender full of coal for a steam trip that never occurred - the GTW cancelled the trip for non-payment of fees. Soon after, the CRI&P filed for abandonment. In the ensuing legal activity, the Blue Island Yard was sold to METRA, who decided to redesign the property to meet other needs. METRA asked Richard Jensen to move his locomotive, but was unwilling to assist him in pushing the locomotive 150 yards to the Iowa interstate. Metra also refused to allow an inspection of the locomotive which would allow Richard Jensen to have someone else move it. At one point, Metra was willing to allow IRM to move the unit out, but without title, since legally, it belonged to Mr. Jensen. The courts ruling was that Metra was indeed allowed the use of it's property, but Metra could not move it. Metra went back to court, asking relief, and got permission if it were not moved, to be scrapped. Metra continued negotiating with Mr. Jensen, (so did IRM) but to no avail. When the news of this predicament hit the Chicago newspapers, and several groups, including the Illinois Railway Museum, offered to move the locomotive free of charge, just to get it out of harms way. However, legally, no one could touch it. But an exasperated METRA did. METRA scrapped it where it stood, and all railfans could do was stand there and watch in disbelief. The photo (courtesy Jack Hackenbroch) shows the aftermath of the horrible scrapping at Blue Island, IL in July of 1987. Richard Jensen was very disgusted after 1988 due to the events he went throurgh. On March 16, 1991, Richard Jensen, at age 60, passed away. After Richard Jensen's death, the IRM was able to acquire his 4963, rescuing it from a Chicago-area scrap dealer just before it was scheduled to be cut up. Here are the details. When Northwestern Steel and Wire got rid of its ex GTW 0-8-0s in the early 1980s, the IRM acquired six for its collection (only one was moved to the IRM property). In 1988 the IRM wanted to save 4963 (which sat at that scrap yard until 1990! ), and so traded five of the 0-8-0s (8306, 8328, 8372, 8375, and 8379) to the scrap dealer in exchange for 4963. 4963 is now safe at the IRM. It is ironic, that these 0-8-0s which dragged so many fine steamers to their demise in the early 1960s met their end saving a mainline engine from the torch. It is difficult to have a positive conclusion to this story. However, if you consider that there are four other surviving CB&Q Mikados and two other surviving GTW Pacifics, it doesn't seem quite as bad. Consider how tragic it would have been if the last PRR Duplex, or last NYC Hudson, or last Milwaukee Streamlined Hudson had been lost in such a manner (and so recently). The Northern and the Mike -- A Tale of Two Locomotives by J. A. Stowe, 2042 Armitage Ave., Chicago, Il. 60647. I'm looking for a photo of the 4960 when it was painted gold. I'm looking for any other photos of 4960 between the time it was in CB&Q excursion service and the present.